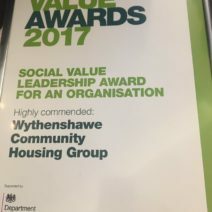 Wythenshawe Community Housing Group (WCHG) was delighted to be ‘highly commended’ in Social Value Leadership at the Social Enterprise UK National Awards. Social value is embedded throughout WCHG, delivering social value in creative and innovative ways in Wythenshawe. WCHG’s independently-audited Social Impact report demonstrates investments that have generated a six-fold social return for the community of Wythenshawe and work is now underway to produce the 2017 report, which will feature initiatives such as the ‘Real Neighbours Timebank’ and ‘Wythenshawe Games’ for the first time. In addition to this, WCHG also chairs a group of youth service providers across Wythenshawe, works with charities and social businesses to help develop their social impact reporting capability and campaigns with residents on a regional and national stage, such as the Manchester Homelessness Charter & the Homes for Britain campaign.